Scott Krevat was a chemistry major at NYU with an enthusiasm for science but not the lab. It seemed like an unsolvable conundrum until his late night snack cravings helped him realize he had a passion for baking and food: an area that combines science and art. When he found out about French macarons he was instantly hooked and quickly discovered that chemistry and baking really weren't too dissimilar. 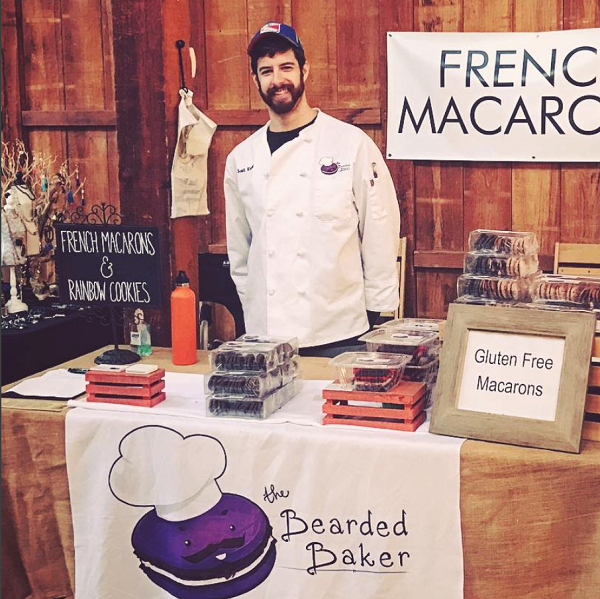 Ready to try something different, he created the Bearded Baker with the idea of using his knowledge of science and his well-tuned palate to create unique but classically delicious baked goods. He likes to create new flavors for his treats and brings his technical expertise to inventing vegan and gluten-free versions of traditional desserts. Favorites macaron flavors are Rainbow Cookie (Raspberry & Chocolate with Almond) and Thai Iced Tea. The Bearded Baker also offers Rainbow Cookies and Gluten-/Nut-Free Vegan Brownies.